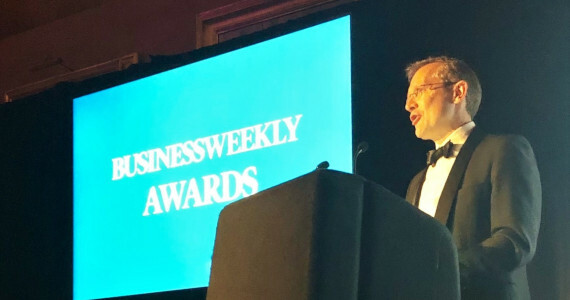 Regional entrepreneurship and business success were celebrated at the Business Weekly Awards on 20th March at Queens’ College, Cambridge, with Professor Tim Minshall, Head of the IfM, as keynote speaker. The event is supported by the University through sponsorship of awards by Cambridge Enterprise in the categories of Academic Entrepreneur of the Year, this year awarded to Tuomas Knowles for his work with Fluidic Analytics and Wren Therapeutics, and Professor Steve Jackson, founder of three companies and originator of Olaparib/Lynparza; and Lifetime Achievement, this year jointly awarded to Sir Shankar Balasubramanian and Sir David Klenerman partner pioneers in genome sequencing. The University’s Judge Business School also sponsors awards, in the categories of Cambridge Graduate Business of the Year, this year awarded to Arm; and Woman Entrepreneur of the Year, won by Poppy Gustafsson, CEO of cyber defence world leader Darktrace. The overall Business of the Year was awarded to Ieso Digital Health, which provides live, one-to-one cognitive behavioural therapy on behalf of the NHS and some of America’s biggest healthcare providers. Stepping straight off a long-haul flight back from Japan didn’t stop Tim Minshall from delivering an enthusiastic keynote speech, in which he literally tore up his notes and instead extolled the entrepreneurial environment of the Cambridge region and its 3Cs - creativity, collaboration and change. Tim, as the Dr John C. Taylor Professor of Innovation, is a highly active proponent of the Cambridge innovation ecosystem, and has been involved in researching and incubating innovation in the region for many years. He was joined on the stage by Paul Mason of Innovate UK also delivered a keynote address before the awards were presented. The event raised funds for East Anglia’s Children’s Hospices.